Mark Viner co-ordinated the radiography team assisting the forensic investigations of mass graves in Bosnia for seven years. In that time he helped uncover vital evidence to convict those who perpetrated the atrocities in Srebrenica, but also developed techniques that would help in many other disasters across the world. 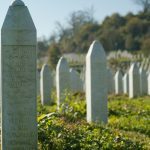 He returned to Srebrenica to learn more about the context and the people in October 2016 and shares his story here. Alison Anderson MBE left a young family behind in order to travel out to Bosnia and help with the forensic work to identify victims' bodies from mass graves and collect evidence to convict war criminals. She returned in 2016 to learn more about the country and the survivors of the genocide and wrote this piece for us about it.